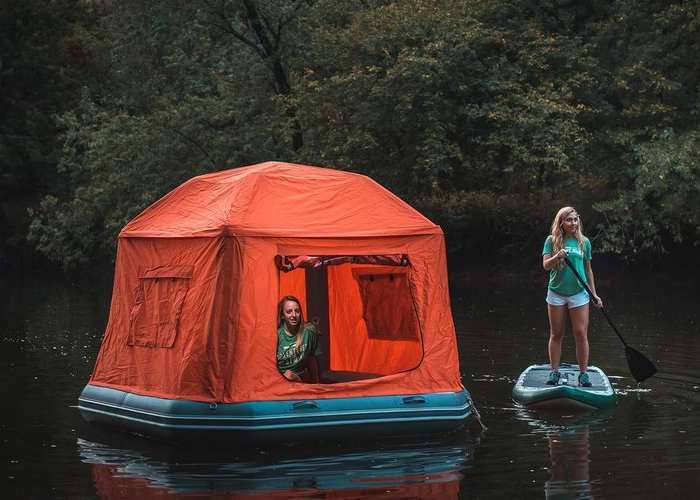 SmithFly has unveiled a unique tent in the form of the Shoal which provides floating shelter thanks to its inflatable raft antenna topper, enabling you to sleep out on the water. The inflatable tent requires no tent poles and will stand up to even the highest winds without an issue, say its creator’s thanks to the design incorporating three air chambers, two in the lower tube, one in the structure. 70% of the earth is covered with water, now you camp on it! Camp on your favorite farm pond, salt water flat, spring creek or eddie on your favorite river. The world is your waterbed. Sleep under the stars, on the water, feel the flow and let it lull you to sleep. The tent topper sides all attach and detach using heavy duty hook and loop for the ability to use just the top and get in and out easily through the sides if the need arises suddenly. – The tubes inflate to 3 PSI the drop stitched floor inflates to 10 PSI. – Measurements: Outside to outside 8’x8′ footprint. – Inside comfortable allowance for people up to 6′-3″ tall laying down. – Taller than that you can rest your head on the tubes or sleep diagonally, like Mike does. – Standing room is up to 6′-3″ in the middle. – Shoal Tent packs down into a burrito roll style carry and storage bag approx. 60″x24″x18″. – Kit comes with Storage bag, patch kit and manual foot pump. – Weight of tent is approx. 75pounds.